SAN ANTONIO, TX – Join San Antonio Spurs All-Star Point Guard Tony Parker at the H-E-B Tony Parker Basketball ProCamp in partnership with Tide. The camp takes place October 15th – October 16th, 2016 at Mission Concepcion Sports Park, 714 E. Theo Ave., San Antonio, TX, 78210. For Boys & Girls, Grades 1 to 12. Source: Procamps. 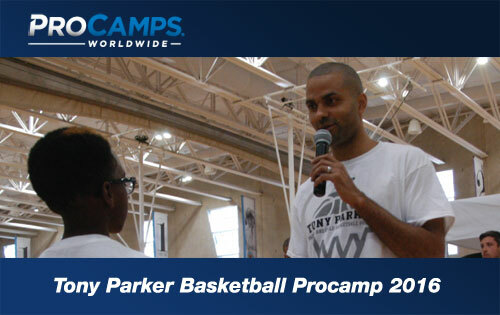 Throughout the two-day camp, Tony Parker and our camp coaches will offer tips and instruction. Campers will experience various stations specializing in fundamental basketball skills and will participate in games and contests. Campers will be placed in small groups by age to ensure that each child gets maximum instruction. Tony Parker, who is of french descent, became the starting point guard for the San Antonio Spurs in the 2001 NBA Draft. Parker helped the Spurs win three NBA championships in 2003, 2005 & 2007. Parker has been named to five NBA All-Star games, an All-NBA Second Team, and an All-NBA Third Team. He was the 2007 NBA Finals MVP. Sports Speakers 360 is a booking agent for pro athletes. If you would like to book Tony Parker for a speaking engagement, appearance or endorsement, contact a Tony Parker booking agent for fees at 1.855.303.5450.